Shopping for a new Land Rover Discovery? If you’re going on a mission of Discovery, why would you settle for less than locking differentials, off-road gear, and the like? The 2019 Land Rover Discovery honors its off-road rep while it steps into some tailor-made clothes. Old name, new ideas? With the latest Discovery, Land Rover honors its off-road past—but doesn’t worry about getting mud on its nicest clothes. The biggest SUV wearing the Land Rover badge returned to its Discovery name last year, after having shuffled through LR4, LR3, and Discovery II over the course of a generation. It hasn’t lost its true identity, though. It’s always followed through on the promise of top-notch off-road capability, with a layer of refinement that’s varied over the years from mayo-thick to veneer-thin. We’re in a mayonnaise era, just so you know. The Discovery no longer flies through the air like a rough brick; it’s a pretty smooth brick now, one that relies less on stodgy SUV cliches than it does some sleeker sport-shoe cues. The front end’s slim, the side view’s plain as Kansas (the state, not the band), and the clerestory above the cargo hold’s been ditched, along with the tail-mounted spare. 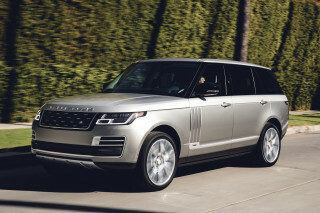 What’s left is pretty, maybe almost anodyne, but a better fit with other Land Rover and Range Rover models. 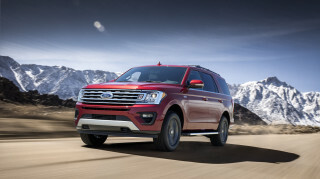 Most 2019 Discovery SUVs get a 3.0-liter supercharged V-6 with ample power to shove it to 60 mph in 7.7 seconds and a prodigious appetite for fuel. The optional turbodiesel’s better in most ways, except for the existential ones (not to mention the price of fuel). The Discovery’s heavy, but doesn’t drive that way. With the available air suspension and off-road package, it’s blessed with enormous ground clearance and sensational mud-plugging talent, with extra kudos to its drive modes and digitally managed traction. On the road, it’s a crossover with decent steering and a quietly composed ride, something we never said of its predecessors. The Discovery’s cabin falls shy of Range Rover standards, but for the price and the job at hand, it’s lavish. Wood and leather mingle in a clubby atmosphere with excellent front seats and very good second-row seats. A power-fold third-row bench comes whether you like it or not on most top-end models, including the ones with the best off-road gear; it tucks out of the way, at least, out of sight, out of mind. No crash-test data exists with the latest Discovery but all models have parking sensors. Full-speed automatic emergency braking is an option, and shouldn’t be; so is Apple CarPlay and Android Auto compatibility, and it only works with infotainment above the base Discovery SE’s pay grade. 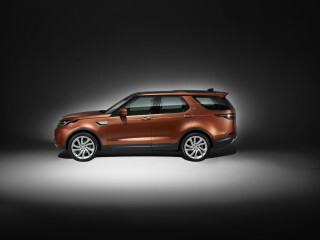 Otherwise, the $53,000 base 2019 Discovery gets a fair amount of luxury and technology, but we’d opt into the HSE or above for the even better front seats, for the higher-end audio, and for the locking rear differential and low-range transfer case that square up the 2019 Discovery with its past: A true off-road machine first, a capable creature-comforts conveyance, second. With its smoothed-over shape—no more Alpine windows!—the 2019 Discovery has made some significant departures from the past. The Land Rover Discovery now has a contemporary shape, one that’s shorn of the hard angles and steep glass of LR4 and LR3 SUVs from the past. The user-friendly shape still says Land Rover, but it’s more a blend of off- and on-road cues, not the box they came in. We do miss the razor-cut shapes of Land Rovers past, but the latest Discovery maps out an attractive niche all to itself. Well, almost. From some angles, and some distance, the Discovery could easily be mistaken for the smaller Discovery Sport. It does that with a few visual tricks that tame its considerable size and its heft. Land Rover designers pull back the grille through the front fenders, which minimizes the size of the front end. The grille itself is relatively small, compared to the wide lower openings and deep chin of the front end. The Discovery’s side view is somewhat anodyne, with just some chunky pillars and a rising window line to distinguish it with a Land Rover flair. At the tail, it makes its biggest departure. The rear-mounted spare tire is gone, though the glass maintains the asymmetrical dip in its glass. The Discovery cockpit gets a plush layer of wood and leather, but it’s more upright and traditional than the sheet metal might hint. The dash carries a horizontal theme, down to the wide-ratio touchscreen implanted at the top of the center console. The gauges don’t have much pizazz: there’s a small LCD display between the meters, a useful but outdated look compared to the exterior. Where the cabin does its best is in bathing the passengers in natural light. Wide and tall windows and two standard sunroof panels open up the interior, as does a low beltline. The lighter-toned interior colors imbue it with an even more open feel—it’s a high school gymnasium, compared to the dark interiors of some German rivals. The 2019 Discovery delivers impressive performance, on and off road. The 2019 Land Rover Discovery doesn’t pit refinement against prowess. It pairs them up, and turns daily SUV driving into less of a chore than Land Rovers past. The Discovery comes with a V-6 engine, but there’s a choice between gas and diesel. Gas models use a 3.0-liter supercharged V-6 rated at 340 horsepower and 332 pound-feet of torque, coupled to an 8-speed automatic that knocks of smooth, smart, and effortless shifts whenever it’s asked. The ZF-sourced gearbox is one of the best available off the shelf, and it’s finely tuned here for ideal, almost invisible performance. Gas-powered Discovery SUVs can gut it out to 60 mph in 7.7 seconds, which sounds average and feels it, too, mostly because the power peak doesn’t arrive until the engine’s spinning at least 3,500 rpm and because it checks in at a lumbering 4,900 pounds. It’ll hustle when it needs, but you’ll want to make sure it’s prepped with a stiff dip into the gas. Switch into the turbodiesel and the acceleration times drop. The diesel’s torque peaks just above idle, at 1,750 rpm, and takes just 6.9 seconds to cruise to 60 mph. It’s quiet, torquey, and though it runs out of breath at higher revs (about 5,000 rpm, high by diesel standards), it also sips less fuel. It costs about $2,000 more than the gas model, and diesel prices aren’t doing it any favors—but for long-term durability and throttle modulation off-road, it could be worth it for a select group of drivers. All Discovery SUVs get four-wheel drive; some come with a locking rear differential and a low-speed transfer case. Base Discoverys get decently responsive electric power steering, and a steel-coil suspension with 8.7 inches of ground clearance, about the same as an average Subaru crossover. We’ve spent time only in the high-end off-road models with the available air suspension, which can raise itself 1.7 inches over its usual 8.1 inches of ground clearance for a total of 11.1 inches of clearance. The air-sprung Discovery gains better damping as well as the higher adjustment range; it can douse the worst bumps on fussy roads, or clamber over rocks without jouncing passengers into a new ZIP code. It betters the Disco’s departure, breakover, and approach angles, not to mention its articulation max and its wading depth. In all, it’s a superb way to see something more than gravel trails—even if you’re forced to take a skimpy third-row seat for the pleasure. Skip the third-row seat—if you can—and the 2019 Discovery soothes with a suave, spacious interior. The upright stance and tall roof of the Discovery have been brought down from its past iterations, when it was sold as the LR4. It’s less boxy, for sure, but from the inside it’s tough to perceive any lost space. In front, passengers get all-day comfort from buckets with lots of adjustments and a wide range of motion; they’re even better in the HSE Luxury-trimmed Discovery, with heating and cooling. In the second row, the stadium-seat effect has been eliminated; those seats no longer rise higher than the fronts, which increases head room. The second-row seat also has 38 inches of leg room, expansive even by three-row standards. The second row feels even more spacious than the numbers imply thanks to twin standard sunroofs and a light-toned interior. Some models get reclining rear seats, which is great for long-distance trips. We’re less fond of the third-row seat in the Disco. 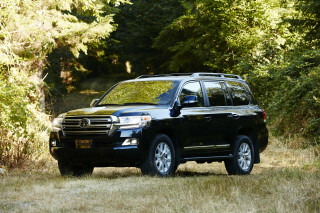 An option on most models, the third-row seat comes standard with the versions equipped with the extensive off-road hardware. Though it power-folds out of the way, and leaves a flat cargo floor behind, the third-row bench suffices only for small passengers. Cargo space behind the third row is just 9.1 cubic feet, but that swells to 45 cubes when the back row’s folded or skipped. Behind the front seats, the Discovery offers 82.7 cubes of storage capacity. The Discovery’s also blessed with lots of small storage bins and trays, including a hidden compartment behind the climate controls, an available refrigerated center console, and a configurable cargo area with useful tiedowns. The Discovery also offers a Fitbit-style activity key: You can leave your keychain behind and wear the waterproof bracelet for access to the Discovery’s storage area. With its softer, leather-covered interior, the Discovery’s no longer so wash-and-wear, which might turn off those who really want to take it off-road. We’d worry about scratching any vehicle at this price point, and fret for the wood and black-plastic trim in its swell interior, too. It’s lovely, but maybe too lovely for the mission at hand? The Discovery has yet to undergo crash testing. All Discoverys now come with automatic high beams, parking sensors, LED headlights, and active lane control, along with mandatory features such as a rearview camera. Some models get standard blind-spot monitors, adaptive cruise control, and forward-collision warnings with full-speed automatic emergency braking, the latter which should be standard equipment. A surround-view camera system adds a few hundred dollars to the price tag, but we think it’s absolutely worth it, especially in off-road driving. A head-up display is among the safety options, too. The 2019 Discovery misses out on Jaguar’s lavish warranty, but it has the luxury and technology front covered. Land Rover sells the 2019 Discovery in SE, HSE, and HSE Luxury trim. Base models cost about $53,000, while the most expensive editions start at just below $70,000. The least expensive Discovery SE has power features, power front seats, a power tailgate, 19-inch wheels, twin sunroofs, leather upholstery, two rows of seats, dual-zone climate control, keyless ignition, automatic high beams, and an 8.0-inch touchscreen for infotainment. LED headlights became standard this year. Full-speed automatic emergency braking, Apple CarPlay and Android Auto, and satellite radio all cost extra on the base model. HSE editions—our choice in the lineup—add 20-inch wheels, a new wade-sensing system that measures water depth and compares it with the vehicle’s maximum wade rating, navigation, premium audio, and a 10-inch touchscreen for infotainment that can be equipped with Apple CarPlay and Android Auto compatibility for an additional $300. HSE Luxury versions get a low-range transfer case, an air suspension, three rows of seats with a power-fold third row, heated second-row seats, a finer grade of leather upholstery, three-zone climate control, and a 14-speaker audio system. On non-Luxury editions, the third-row seat comes in a bundle with the off-road gear and air suspension, and we think it’s worth a couple of thousand dollars. For more extreme off-roading, the Discovery can add a locking rear differential and a drive-mode selector pre-programmed for snow, rocks, sand, and mud. We’d also take the tow-assist function that controls trailer hitching via a console-mounted knob. Reasonably priced options that we think should be standard include blind-spot monitors and adaptive cruise control. Rear-seat entertainment’s a pass at more than $2,200; buy a pair of tablets instead. The head-up display, at $1,000, doesn’t seem worth it either. While Jaguar owners get treated to one of the best warranties of all new cars—5 years or 60,000 miles, full coverage including maintenance—Land Rover’s warranty is average, at 4 years or 50,000 miles. A turbodiesel does much better, but the most popular Land Rover Discovery engine’s not great on gas. With its roam-anywhere hardware, the Land Rover Discovery might be excused for low fuel economy. It doesn’t have to call in that marker, though, with its available turbodiesel engine. The supercharged V-6 found in most Discovery SUVs earns EPA ratings of 16 mpg city, 21 highway, 18 combined. 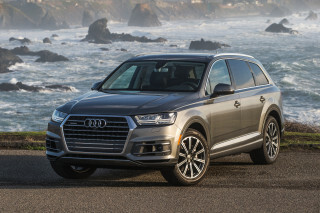 Opt for the turbodiesel—a roughly $2,000 upgrade—and ratings climb to 21/26/23 mpg. With the cost of diesel, the extra expense might take years to pay itself back. But the Discovery, even with its gas engine, isn’t far off the mark on gas mileage. 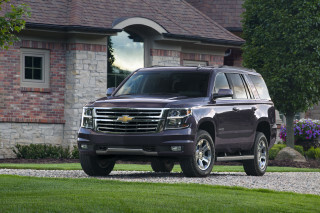 Most of its rivals have combined fuel economy in the low-20-mpg range. Looking for a different year of the Land Rover Discovery?